This a photograph of Frederick Newton Raymond, who was born January 27, 1873 on a homestead in Kanwaka Township west of Lawrence, Kansas. His parents were Joseph Murray Raymond and Hila Keziah Bennitt Raymond. Frederic attended prep school in Lawrence and then the University of Kansas where he graduated in 1896. He was granted a small scholarship to do graduate work at Columbia University. 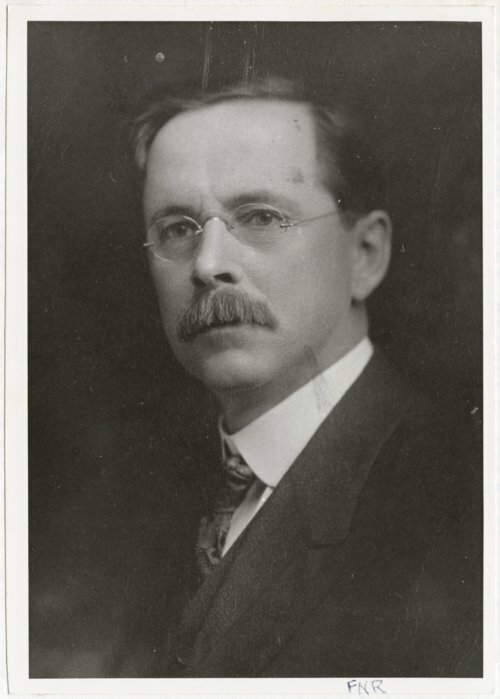 After completing a master's degree, he worked for the Chicago and Alton Railroad in New York City; however, family illness brought him back to Lawrence, where he became an instructor at the University of Kansas. In 1912, he met Ida May Gleason and they were marrried on August 25, 1915. Frederic and Ida moved to Lawrence, Kansas, where he taught at the University of Kansas. They had one child Elizabeth Raymond. This photograph appears in Twenty-Five Years The Road Taken by Robert S. Raymond and Elizabeth Raymond, 1946-1971.